Should be looking East from Saginaw or Harrison Street. This is all Riverbank Park and U of M Flint now. Hey Gordie, I'm not 100% sure about this, but from the pictures I've seen I think this is from the railroad station that was near the Grand Traverse street crossing (maybe the Piere Marquette?) looking back east toward the Saginaw Street crossing. 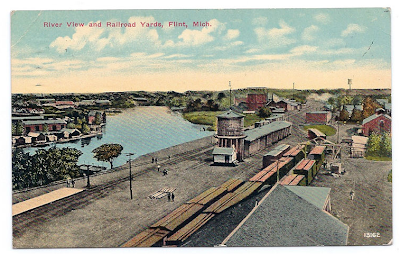 I know I was confused as to where it was as well, but there is a poscard history of Flint that the library has that shows the depot being south of the river with the railroad tracks that were just south of the Saginaw Street bridge leading up to it. That would make the roof in the foreground the roof of the depot and the multi-story red-brick building in the distance beyond the water tower would be approximately where the Character Inn/Residence Hall is today. I think. If I had to make a guess using a modern aerial view, I would say the water tower in the postcard picture is located near the intersection of Water and Lyon Streets. I don't believe I am exactly correct on this though. The building at the very bottom looks like a depot. Maybe knowing where the depots were located will help. I think knowing the era would help. Is it late 1800's? The view is looking east from the site which is today part of the U of M Flint campus, (approximately where the library building is). The CROB, (or the buliding that was once called the CROB), would today be just off of the right side of the picture. The IMA, (Autoworld), complex was later located just out of view on the opposite bank of the river. The roof of the old Pere Marquette depot building is seen in the forground. Reminds me of the old Flint Lumberyard by Water Street. Steam engines were used through the forties, but the depicted wooden boxcars look turn-of-the-century. The distant large tank is for coal-gas-storage; such a tank was located east of downtown, near where the modern main post office is located. That tank was removed when modern natural gas distribution began, and replaced with a larger but mechanically similar tank for natural gas near the Consumers complex on East Court Street. A hardwood sawmill is visible on the opposite bank. AFAIK all of the sawmills were on the north bank. This would have been in the carriage-works days, before automobiles and therefore before any of the GM-associated buildings. My guess is that the second post in this thread is correct, and we're looking ENE from a vantage point east of Saginaw Street. I have a different, possibly companion, post card that shows what appears to be this exact water tower, including the small white shed in front, looking east. I was also able to match up one of the buildings in the background and the smaller water tower in the distance, (upper right quadrant). 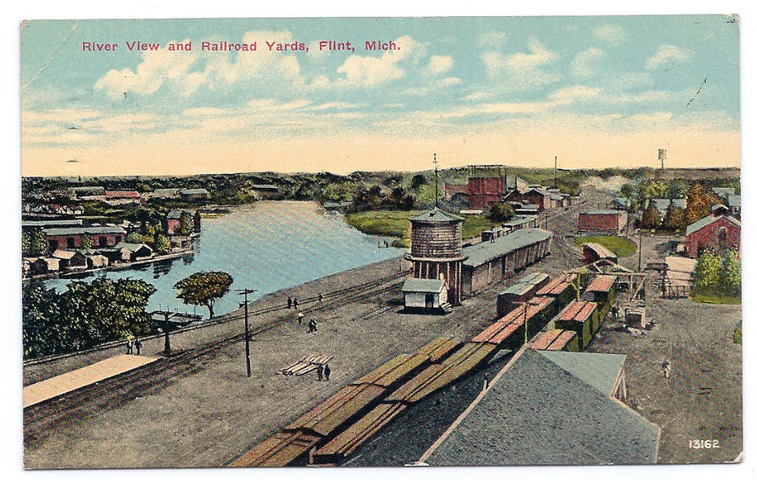 The second post card shows the Grand Trunk Depot, which would be located just out of this photo to the left. The light colored strip at the lower left of this shot matches the end of the passenger platform that was adjacent to that landmark building. From another old photo, I found the opulent depot structure was located just west of what would eventually be Harrison, (which at the time ended just south of this area but would later cut right across the middle of this scene), where the State office building, (now U of M? ), was built. The water tower would have been just east of the current location of Harrison, in the approximate vicinity of where the U of M library is now. I said "second post is correct", but I really meant the "second post" that follows the first four. I really can count better than to confuse 2 and 5, usually. The multi-story red brick building in the center could be the Hamilton Mill. It looks similar to pictures I've seen of it but from the other side looking west.